Apartment in calm zone with great community swimming pool and bar. To 2,5 km from the marvellous beach of Moraira's sand. Near to numerous coves of transparent waters. To 500 m. supermarkets. Moraira is a zone full of restaurants, activities of leisure so much by day as by night and marine precious places. 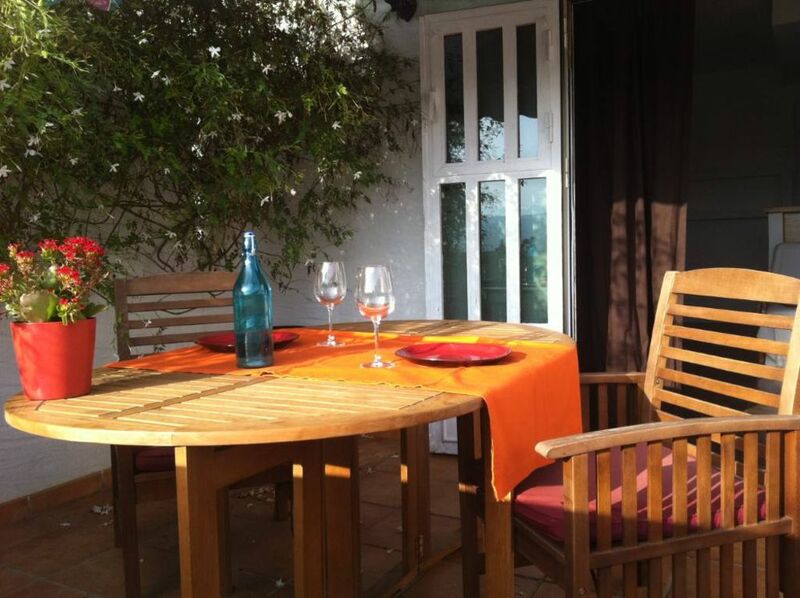 "Lovely self catering apartment provided by hospitable owners. Our stay was very comfortable. There is a large pool available and all amenities are close by. The Mercadona supermarket is within walking distance and Moriara with its marina and shops is only a 10 minute drive away. Exactly as described. Would recommend this to anyone." "Exceptional cosy, comfortable and nice apartment. Fantastic view from the spacious terrace. Everything you could need is in the neighbourhood. Ideal for a carefree and relaxing holiday. And last but not least, very sympathetic and kind owners." "We have staid for almost two weeks in the apartment with a small child. We found a very cozy, well equipped and well looked-after apartment, fantastic surroundings and especially nice and careful hosts. Highly recommended stay - we were really happy and felt confident." "Small but cosy and comfortable, completely new and fully furnished. Wonderful location, very quiet, near both mountain and beaches. Price more than accurate. Propietors friendly and helpful. I would surely come again!" El apartamento es tal cual, muy acogedor y con todo lo que necesitas para pasar unos días de vacaciones. La zona muy tranquila y muy bonita. Se agradece a la llegada toallas colocadas y disponible agua,jabón,papel higiénico,balletas todas las pequeñas cosas que no apreciamos pero que tanto echamos de menos cuando no están. Es una zona muy tranquila y muy accesible al igual que cercana a varias playas. Anfitriones amables y colaboradores lo que siempre es muy agradable. Muchos sitios bonitos por ver y muchas ganas de volver. En verano tiene que ser genial cenar en la terraza del apartamento y disfrutar de la gran piscina comunitaria . Highway AP-7 exit Teulada-Benissa-Calpe. To 5 Km from the exit of the highway. Zone of very good restoration and beaches and crystalline coves. In a strategic place between Calpe, Denia, Jávea, Benidorm and Moraira.